Metcheck.com - Storm Forecast Discussions - Weekly Storm Forecast - From 6 August 2018 - Expert Meteorologists Analyse Storm and Convective Forecasts For Countries Around The World. Here is the period in question. We have the hot air across parts of East/Southeast England with a shortwave trough running in from the Northwest ahead of the main cold front. Meanwhile, a shallow low pressure system develops across Biscay and heads Northeast just ahead of the shortwave trough. All the mesoscale models indicate a degree of widespread thermal uplift across the English Channel and Southeast/East England later on Tuesday afternoon with showers developing. 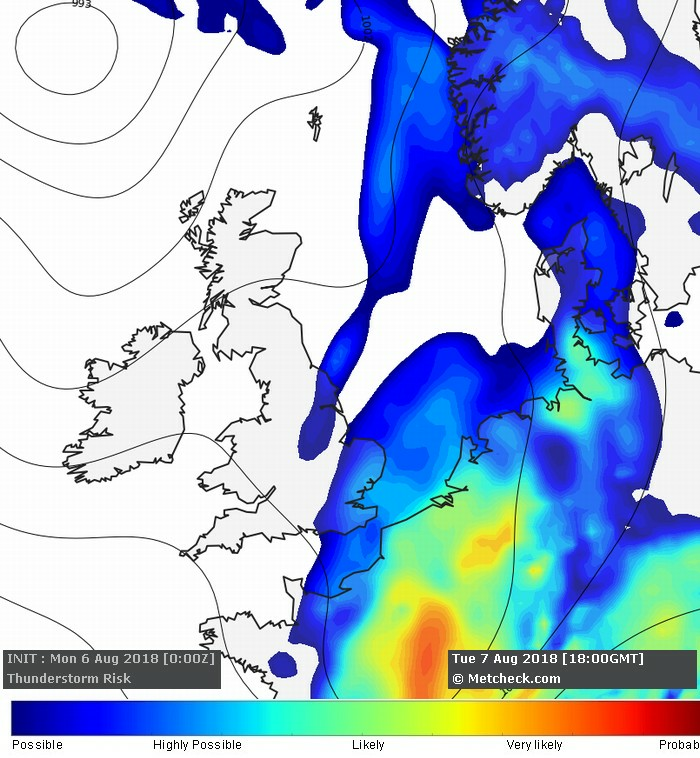 FMI and EURO4 take the forcing a little further West and this allows thunderstorms to develop across parts of Southern and later Southeast and East England as cooler air comes in at upper levels with a decent amount of wind shear through all levels. ICON and ARPEGE however go more along with the GFS way of thinking and always keep the main forcing across the Northeast quadrant of the developing shallow low pressure system. As a result, we are going between the two scenarios and bring a risk of thunderstorms across parts of Kent, Essex and Suffolk on Tuesday afternoon, then a marginal risk of thunderstorms across Southeast and East England later on Tuesday evening and overnight as cooler air sweeps in across all areas from the West.